This entry was posted in Family, Happiness, Love, Marriage and tagged anniversary, Love, Marriage, marriage secrets, marriage tips. Bookmark the permalink. Happy Anniversary! What a great achievement. Thanks for keeping us educated and entertained with the blog. We enjoy it and learn from it so much. One tip… I would say the most important thing we’ve learned is that no couple is perfect and every married couple has problems. What makes or breaks your marriage is how you confront problems, communicate about them and ultimately work through them. Thanks, Melissa! Yes great point, we all have problems and how we work through them ultimately makes us what we are. Thanks for the advice and the kind words. Peace. Happy Sweet 16, Lori!! I love your blog and to hear a bit of the personal side makes me smile. We have been married 32 yrs. double 16 and my sentiments are the same as yours; we aren’t who we once were either – thank God. Our marriages are reflections of Gods love for His church and every choice, every thought, and how we deal with conflict matters. Our marriage tip is pay attention to whom you worship – if it’s God you will grow all the more closer to Him and each other. If you’re worshiping self or your marriage it will only grow increasingly more difficult because God is a jealous God. As your love grows vertically it will certainly grow horizontally. Much of this thinking comes from Paul Tripp’s excellent book on marriage, What Did You Expect? Sorry for the long comment, but I’m excited for you as you begin your 17th year as husband and wife! Thanks, Debi. I always welcome long comments from you. 😉 You’ve been one of those virtual friends who have assisted me and the blog. We’re at 29 years, and it only keeps getting better! My one tip: learn to take delight in delighting your wife or husband. Thanks, Niloo! You are very welcome. Scott, that’s a long time, congrats to you. Another great tip from you. Yes, delight in the wife/husband of your youth. Happy anniversary! I love the picture you shared with us, you two look so cute together. I never thought I would be one to get married, but I’m engaged now, and love my hubby to be very much. My parents are very unhappily married and I didn’t want to turn into them, and hold the same grudges, arguments, etc. So I came across your blog and read your articles every time to see what I can do to improve myself. Thanks, Sarah. Many of us grew up in divorced or troubled homes, but we have the power to break that cycle and can always improve our skills and attitudes. Congrats on your engagement and decision to enter into a blessed union. I hope it offers you the same joy as it did for us. 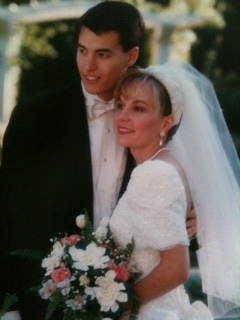 Happy Anniversary, Lori! We have been married for four years. Not very long time, but we have been gone through a lot. After marriage, we realized that marriage is not only between the couple, but it involved two families. Very complicated. We learned a lot through the process, and we have been changed and grown up a lot. Thank Lord. I’ll visit your blog often in the future to learn more marriage tips. Thanks again for sharing! Four years is nothing to sneeze at. Glad you have managed your complicated families. Yes, I think more people should consider the family they are marrying into, not jus their potential mate. Thanks for visiting! We’ve been married for 10 fantastic years. My best marriage tip is to simply spend a little time each day focused ONLY on each other. This sounds easy, but it can be really difficult in the high-paced and distraction-filled times we live in. If you spend 15 minutes each day simply being a Couple, your marriage will be blessed incredibly! Happy Anniversary! I did not know that your husband had hair! Good one, Jamie. Or was it a toupee? Your wedding day was such a beautiful celebration and I feel honored to have been there! Congratulations on 16/21 years together. I have also loved being a part of this journey with you and reading your marriage advice. My husband thanks you, too! We will celebrate 14 years of marriage next month and 17 years together. I still find him exciting, intelligent, super hot (!) and consider him my best friend. My advice, stay connected to one another physically, emotionally and spiritually no matter what else is going on in your lives. Cheers! Thanks so much you dear friend. You’ve been so generous to me for years in too many ways to recount. Happy almost 14th anniversary to you, also. You two make a great couple, and thanks for sharing your very good advice. Cheers to you. Lori – What a beautiful wedding photo! Congratulations on your anniversary, and I pray for many more years of God’s blessings on both of you. As for the marriage tip, since I blog about godly sexuality, I wondered what one thing I would stress in that area and came up with this: mutuality. Spouses need to fully participate with one another in experiencing intimacy, paying attention to the other’s needs, desires, and value. Blessings! Best wishes and congratulations on your anniversary! What a Beautiful picture! Love it! You haven’t changed a bit! Gosh I don’t feel in the position to give marriage tips! But in honor of your anniversary as you say… Keep a good sense of humor, keep your promises…never let go. Hang in there even when you don’t feel like it, and and when you are mad as mad can be, think of your three favorite things about your husband that makes you smile. Or at least something he said or did lately that was funny. Thanks a million, Pia. You certainly are in a position to give marriage advice with your 16 year great marriage! Happy anniversary to you both. Love your tip BTW. Blessings. I have been married for 13 years to my beautiful best friend and lover. My tip: do everything in your power to communicate unconditional love and acceptance to your spouse, making especially sure to show affection and speak approval whether you feel like it or not. Aaron, such a sweet sentiment of your wife. Congrats to you for finding a wonderful mate. So few couples do communicate unconditional love and acceptance, but what an impact that can make! Great reminder and thanks for commenting. Cheers! Spend money on your marriage – after 45 years of marriage – what fun we’ve had! Thanks Ronnie, I guess your monetary spending shows where your priorities are! After 45 years of marriage, we should definitely hear what you have to say. Kudos to you. Happy Anniversary ! I am married 22 years. Thanks for all your advice. My tip is to remember that only you can make you happy. Always respect your husband and respect yourself. So true. Self respect and self responsibility are often left out of the equation and lead to feelings of unhappiness. Well said. Thanks! Best wishes for your continued marital bliss. Congratulations! We’ll be celebrating our 39th soon. Mutual respect and compassion is the key to everything! Wow, happy almost 39th. That is terrific, and I agree with your admonition to have mutual respect and compassion. All the best to you. I just discovered your weblog on the web and I sure am very impressed !! You provide some fantastic information and I will suggest your weblog to all my friends. Thanks for visiting and for sharing the blog. I appreciate the compliments. Cheers! Hey my friend! CONGRATS to you and your beloved on a happy anniversary. My words of wisdom — nurture your friendship with your spouse. Spend time together. Ask for each other’s opinion. Extend grace. Hug. Listen. Share. Fight fair. Laugh together. Support each other’s interests. Thanks, Julie–always a friend and always helpful marriage advice! Firstly, happy anniversary. 16 years is a testament to persistence! We continue to be inspired by your blog and how it lights the way to healthier marriages. Our marriage tip to current and prospective married couples is to be willing to grow and to let their spouse grow. Marriage is organic, It must be nourished. And its members may grow at different rates. The good news is that they ARE growing. Thanks so much for the kind wishes. More great advice from you. Yes, often I hear people say they are growing apart, when in fact they are growing at different rates. We can’t expect to be in the exact same growth pattern, but we can work on connecting where we are and sharing how we are growing. I’m going to have to compile all this great advice! Blessings. Happy Anniversary! For marriage advice, which tape/cd are you going to listen to? Are you going to focus or dwell on the way your spouses annoys you or are you going to focus on the positives, the many ways they bless you. I firmly believe it is a choice. We see want we want to see in each other. Lori – A late happy anniversary to you! My Lori and I will be 27 years in January. What we have learned is it always gets better if you hang on, and the best is yet to come. I am 37 years old and will have been married 17 years come December. And our kids are only 5, 4 and 1 (we waited til we were “ready”). My tip : love is a verb, not a noun.